In 2009, in response to one of the recommendations of the Pitt Review of the Summer 2007 Floods, Defra commissioned three Multi-Objective Flood Management Demonstration Projects, including the Holnicote Project on the National Trust Holnicote Estate in West Somerset. The projects were all tasked with generating hard evidence to demonstrate how working with natural processes, implementing a range of natural flood management (NFM) measures, and utilising a partnership approach, can contribute to reducing local flood risk while producing a wide range of other benefits for the environment and communities. Working with natural processes represents a range of techniques that aim to reduce flooding by working with natural features and characteristics to store or slow down flood waters. The Holnicote Estate covers the majority of two study catchments, Horner Water and the Aller. 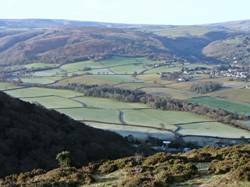 The catchments are located on the north-east edge of Exmoor National Park and flow down to the sea in Porlock Bay. The hydrological monitoring network implemented in 2010 was designed to provide high-quality, high resolution rainfall, stage and flow data for assessing the impacts of NFM measures on flood risk in Bossington, West Lynch, Allerford and the Piles Mill area through hydrological data analysis and a variety of modelling approaches. A range of NFM measures have been successfully implemented at Holnicote since 2011 including: moorland drainage interventions, woody debris dams, woodland creation, leaky weirs and offline flood storage areas. Advice has also been provided to the land managers on soil management practices in arable and grassland systems across the catchment. 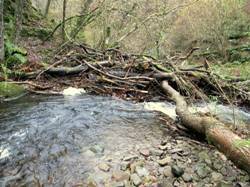 • The withdrawal of coarse woody debris removal and management in woodlands is a highly cost effective and simple way of achieving NFM in the medium to long term, as well as providing considerable biodiversity benefits. 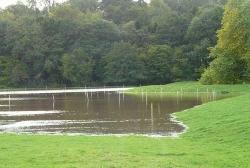 • During the extremely wet winter 2013/14 in Somerset, there was no flooding in the vulnerable villages in the catchments that have experienced regular flooding in the past, containing nearly 100 properties at risk with an insurance value of £30M. • A set of newly constructed offline bunded flood storage areas helped to deliver a 10% reduction in flood peak during a severe storm in late December 2013 on an already saturated catchment. • Careful management of soils and the continuance of agri-environment support mechanisms hold the key to creating sustainable and resilient rural landscapes. • Regular and sensitive engagement has created an environment within the local community that makes all those involved with catchment management more amenable to suggestions for land management changes that have multi-beneficial outcomes. • A local project co-ordinator involved in all elements of NFM identification, approval and implementation, together with the stakeholder engagement activities, greatly contributed to the success of the project. The National Trust are committed to maintaining the Holnicote research platform going forwards as part of their wider national ‘Catchments In Trust’ (CiT) Initiative – a strategic partnership project with the EA. This initiative aims to enable a programme of catchment based projects which deliver multiple benefits (including flood risk management, water quality improvement and biodiversity enhancement), both on National Trust managed land and within the wider catchment. The delivery of this longer term catchment management initiative at Holnicote will be delivered by the upgrade and enhancement of the hydrological monitoring network (see inset left) to ensure the continuance of high quality data collection for future data analysis and modelling purposes. Further targeted NFM measures will also be implemented as per the original proposals from 2010, in order to increase their spatial extent and beneficial effects.